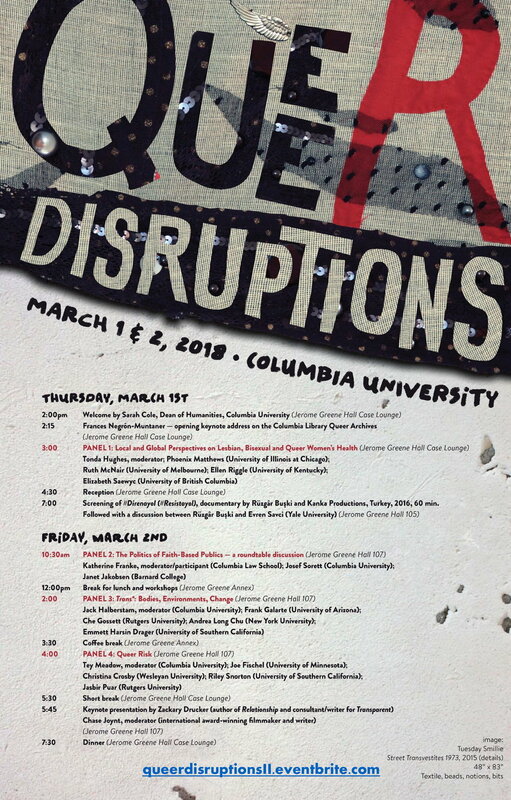 Join us for the second annual Queer Disruptions conference at Columbia University in the City of New York. Additional support provided by the Institute for Research on Women, Gender, and Sexuality, the Center for Gender and Sexuality Law, the Gender and Public Policy Specialization at Columbia | SIPA, the Program for the Study of LGBT Health at Columbia University, the Center for the Study of Social Difference, the Department of English and Comparative Literature and the Barnard Center for Research on Women - BCRW. Registration required. Link available here. Queer Theory: Here, There, and Everywhere is a CSSD working group to discuss, debate and investigate the politics of sexuality and gender in a global frame.